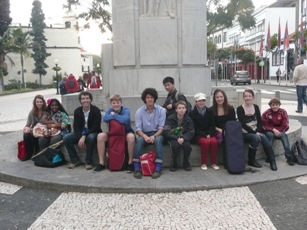 A quite unforgettable experience for both musical and non-musical reasons was had by the group of ten local young musicians and three teaching staff in Funchal Madeira, as the Jersey Academy of Music’s tour was brought to an abrupt halt by the extensive flooding on the island, one of the worst natural disasters in Madeiran history. 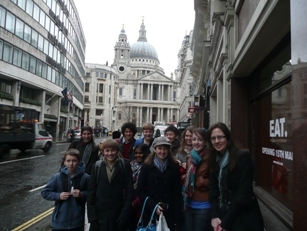 The first day of the tour involved a busy day in London, firstly a visit of the Guildhall School of Music and Drama including a tour of the extensive music facilities, followed by a lunchtime concert at St Martin In The Field Church, Trafalgar Square. 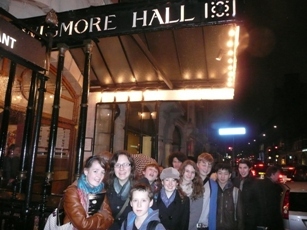 In this concert, a group of teenagers from the Junior Guildhall were performing, and a particularly outstanding performance was given by Tyler Rix, the young saxophonist from BBC 2’s Classical Star. 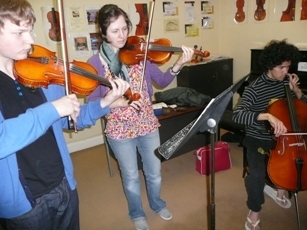 The rain did not deter the group from a walk to J.P.Guiver, a specialist Violin Maker workshop off Oxford Street. Following a pizza the final activity of this busy day was an inspirational concert at the Wigmore Hall, in which the Capucon Trio performed an outstanding programme of chamber music by Brahms. Upon arrival the following day in a stormy Madeira, the group were welcomed by Ines Costa Neves, the Director of the Escola Das Artes, and Vladimir Proudnikov, the Director of the Unissono Violin Ensemble, who both made us feel extremely welcome and looked after us all with the utmost care during our stay. The first day in Madeira involved extensive rehearsals and coaching at the Escola Das Artes, followed by a chance to visit Funchal and explore this truly beautiful town. The following day began with more rehearsals in preparation for the first concert of the tour, followed by an Official Lunch (with amazing Espetadas!) 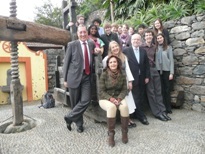 at the Quinta do Estreito, hosted by Dr Brazao de Castro, the Regional Secretary of Human Resources. The restaurant was situated half way up the mountains, with spectacular views over Funchal. The first concert of the tour took place that evening at the Museu de Electricidade, a fascinating museum which contains a beautiful wooden lecture hall which is absolutely ideal for classical music. 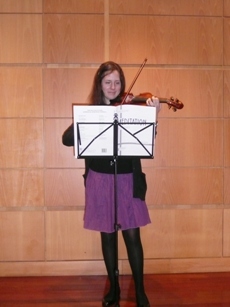 All the students performed in front of a small but enthusiastic audience of locals and tourists. The rain started to arrive particularly heavily during the night, and the following morning conditions were poor. Rehearsals begun with the Academic Orchestra, a full symphony orchestra of Madeiran students which the Jersey young musicians joined in with for a rehearsal of Borodin’s Prince Igor. However, at the end of the rehearsal we were told by the Director of the Conservatorio to return to our hotel as news of potential flooding had arrived. A difficult journey back to the hotel through muddy streets led to the group sitting in front of the television watching the events unfold. 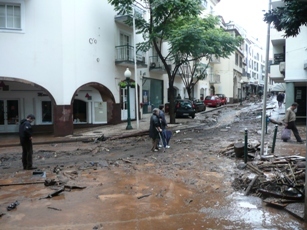 It was truly saddening to see the devastation caused by these terrible floods, and the following day we joined thousands of Madeirans walking through the streets of Funchal and watching the diggers attempting to redirect the flow of water away from the streets and back into the Levadas. The rest of the tour’s activities were cancelled, but as all musicians do we decided to improvise, and took musical performances to two of the large hotels on the island, where trapped holidaymakers presented an enthusiastic and captive audience. 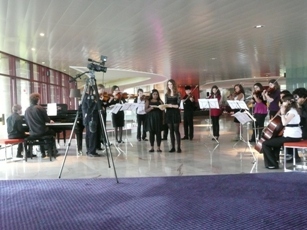 One of the performances even took the interest of the national media, and the group appeared on GMTV. So all in all, this was truly a tour of two halves, and to be caught up in the events of those days in Madeira was a humbling experience. Our heartfelt thanks go to all the staff at the Escola Das Artes for looking after our group so well. Upon leaving the island to return to Jersey, Gonzalo gave a moving speech to the group inviting us all to return to this beautiful island on another occasion and under different circumstances. Which we are desperately keen to do. In a wonderful gesture of support for the Madeira crisis, the young musicians performed in a fundraising concert at St Thomas’s Church on March 6th. Joined by the island’s Madeiran and Portugeuse community, including the St. Thomas’s Portuguese Choir, the Grupo de Folclore de Tradicoes Madeirenses, singer Tatiana Camacho, and Abel, Ruie and Franco’s Fado group, the concert raised over £3700 for Jersey Side By Side’s Madeira Appeal. A truly meaningful contribution to the aid effort which demonstrates the close connection our twin islands share.